This festive slice is the closest thing to a White Christmas we’ll ever know in sunny Australia… and we love it! Packed with rice bubbles, coconut and mixed fruit, White Christmas is a hit with kids and adults. Make this slice and keep it in the fridge to share over the Christmas season, or portion it into gift bags and earn brownie points at the office when you gift it to your colleagues. Place copha in a small bowl, place in microwave and cook on ‘High’ for 1½ to 2 minutes (until copha is liquid). Cool slightly, pour onto dry ingredients and mix well. Turn mixture into lamington tin and press firmly. Decorate top with glacè cherries. Freeze until set (about 15 minutes), then store in the refrigerator. 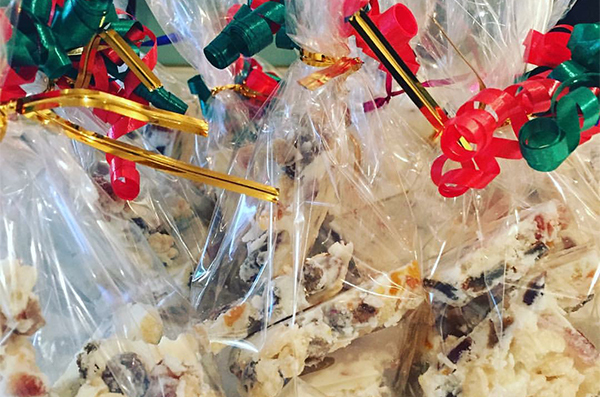 Cut into squares and serve, or portion into gift bags.